Intense, velvety red flowers with deep yellow highlights. Native to the wetlands of the southern U.S., Louisiana Iris are the ideal choice for water gardens, along the edge of streams or ponds, or in other moist areas. This beardless species is available in a wide range of colors, making it a favorite for many gardeners. Its green, strappy foliage looks attractive for several months. Although they originated in the Southeast, Louisiana Iris are adaptable to several climates and most are hardy to zone 4. Unlike bearded iris, they prefer moist conditions and usually do best with about an inch of water each week. 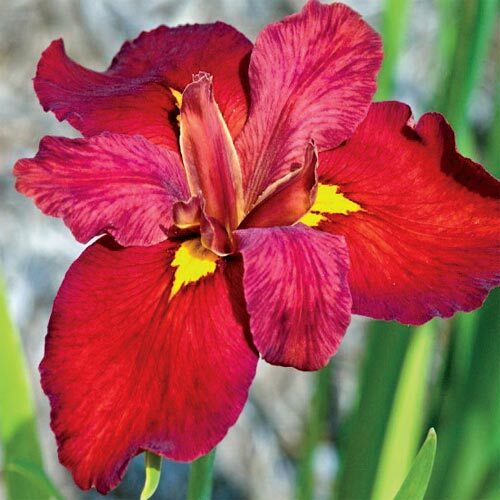 Most Louisiana Iris bloom in early to midsummer and attract hummingbirds. Plant with the eyes just below soil and 24-30" apart. Let foliage die down naturally so nutrients can store up for next season's blooms.